Don’s binoculars stand ready to reveal his next comet discovery. I stood along the side our truck, debating with myself whether it was worth it to set up the big binoculars and search for comets. A thick layer of fog was below me, and a few wisps had worked their way up to my 3300′ elevation. They blew away in a gentle breeze but came back before disappearing again. The moon, which was 33% full and had risen at 12:43 a.m., illuminated the fog from above while the very same fog hid the city lights below. During those ten minutes my mind swayed more and more toward staying, and with not much ado I began to set up my comet hunting instrument. At 1:40 a.m. on the morning of Saturday, August 6, 1988, I began comet hunting session #1696. My wife Laura and son Matthew climbed into the back of the truck—they would be sleeping while I was sweeping. My plan was to cover the northern region of the morning sky, from a declination of 20 degrees north to 60 degrees north of the equator. Most comet hunters do not sweep the morning sky until the moon is a tiny crescent in the predawn sky. I determined in the late 1970s that, with a clear sky and from this elevation, I can see rather well with the moon as bright as 40% full as long as I avoid the vicinity of the moon. Those of us who search for comets from light-polluted locations have learned to put up with a certain amount of light. And this morning the fog was taking care of the man-made city light below. So with the moon up, I would lose perhaps a magnitude of light grasp due to decreased contrast, and that is something I can live with. A peek at the binoculars’ inner workings. The binoculars I used were homemade, designed and developed by myself in the spring of 1983. It was built for under $400 from surplus lenses and eyepieces, mounted in a plywood box measuring 3′ long, 2′ wide and 1′ high. This box of optics weighs over 100 pounds so I attach it to the top of a pipe alt-azimuth tripod mount. 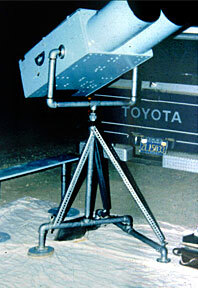 The front objectives are aerial lenses, each consisting of five elements, the front measuring 6.1″ in diameter. The lens system is rated as 36″ focal length with a focal ratio of 8; this implies a 4.5″ aperture. However, by measuring exit pupils of known eyepieces I’ve determined the effective aperture to be 127 mm, or 5.0 inches. The eyepieces give 27 magnification and a field of 2.4 degrees. This instrument was used to discover my previous find in May 1986, the main difference being that now it is on a short tripod so I sit on a bench as I sweep. My first sweep began at 1:40 a.m. near the galaxy M74 and went northward to the Double Cluster in Perseus. I picked up those two objects and over the next hour I would also see diffuse nebulae NGC 1491, and 1624, and a couple open clusters. At 2:32 I picked up an object that was small but appeared fuzzy. It was located at roughly 02h 34m, +31.6 degrees (2000 coordinates). After consulting my two-star charts (Atlas of the Heavens and Uranometria) and finding no objects plotted, I went to my photographic star atlas. I circled its location on the map, where nothing seemed to be and drew a large-scale map showing its location in reference to the stars. This was completed by 2:47, and then I went back to comet hunting. By 3:15 I had swept to the moon’s location and took a short rest; this is where I fill in the logbook, stretch and get then back to sweeping. I also took this time to return to the mystery object, it had not moved (a comet would have). I have since concluded that this is a couple (or more) faint stars which appear fuzzy when seen under low power. This event—finding a false fuzzy object that requires further investigation—occurs every fourth or fifth time that I’m hunting with the binoculars. At 3:20 I resumed sweeping. I picked up four-star clusters in Auriga while my southern limit was slipping southward towards the celestial equator. I was listening to KLOK radio, and disc jockey Jay Stone was playing the song “Can’t Get Close Enough” by Exile. The radio station was in its last week, on Monday it would change to a Spanish-speaking format. Another view of Don’s massive binocular rig. At 4:17 AM I picked up a rather large, diffuse fuzzy object. My first thought was, “Well, perhaps this is galaxy NGC 1637.” I sometimes pick this up while sweeping, but as I continued looking at it I realized that this was brighter and larger than the galaxy. This object, for some reason, looked like a comet. Putting on my glasses and sighting along the binoculars I realized that I was a few degrees north of 1637. Since I knew there was nothing this bright in this vicinity of the sky, I came to the conclusion, within 30 seconds of finding it, that this was a new comet. My next step was to determine exactly where it was and discern any motion that might be present. This information is needed by the Smithsonian Astrophysical Observatory if the comet is going to be confirmed. I tried to identify the star field on my star atlases, but after a few minutes, I wasn’t getting anywhere so I turned instead to drawing a large-scale map of the object with surrounding stars so that I could detect motion. This was done at 4:25. Partly because I didn’t want to wander far from the comet, and because I don’t have a finder on the binoculars, it took a long time to plot the position of the comet onto my maps. But within 15 more minutes, it was finally plotted so now all I had to do was to watch for motion. Astronomical twilight was arriving at 4:38, with my last chance to view the comet at about 5:15. At 5:08 I re-plotted the comet on my large-scale map, it had indeed moved in what appeared to be an NE direction. I estimated, from less than an hour’s movement, that in 24 hours it would move under one degree. This would be necessary to know if I wanted to find it the next day. By throwing some stars out-of-focus and later looking up their brightness, I determined the comet to be magnitude 8.6—fairly bright for a new comet. 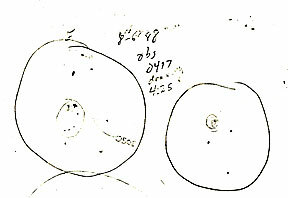 At the eyepiece, Don made this sketch of the comet. I knew that there were no old comets in the area, but there still remained the possibility that the comet had already been discovered in the previous one or two days. So I now had to get home and call the Smithsonian Astrophysical Observatory (SAO) and ask if it had been reported by someone else. I awoke Laura and my son Matthew and had both of them look at it through the binoculars. Laura saw it, but Matthew, two years old, probably did not. The 22-mile drive from Loma Prieta to our home in San Jose takes 40 minutes, even on a comet discovery day. Phone calls to the SAO office determined that no one was there, so I called Director Dr. Brian Marsden’s home and got no answer. Finally, I tried Assistant Director Dan Green’s home and left a message. I slept for 1.5 hours, and then went to a picnic from 10:30 to 1:30. It was held at Vascona Park in Los Gatos and was sponsored by the FAIR adoption group. I then took Laura and Matt to a friend’s birthday party. Upon arriving home I phoned a few friends and my parents. I then called another amateur (and a few professional) comet observers so that they could help confirm the existence of the comet by observing it the next morning. That night Laura and I went to a Hank Williams Jr. concert at the Shoreline Amphitheater. Laura likes country music and I had promised to take her a few weeks previous. It was a good performance. 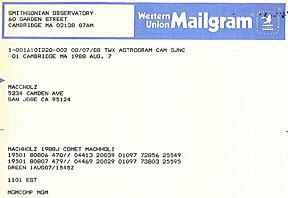 The Mailgram sent out by the SAO about the discovery of Comet Machholz 1988j. We were home at midnight but up again two hours later for a drive back to Loma Prieta. My friend Rich Page, who had helped me to confirm two of my previous three comets, was already there. Mark Mattox, another friend, along with avid amateur astronomer “Steve from Santa Cruz” had set up nearby. Also present was Grant Fjermedal. He had just completed a book (New Horizons in Amateur Astronomy) and happened to be in the area. I phoned him the night before and invited him up. Now the most dreaded thing that could happen at this point would be if we could not find the comet. If no one ever saw it again, then I would look like a real fool. So these moments are tense as we begin searching the eastern sky, beginning at the location the comet was discovered and moving in the expected direction of travel. As on at least one prior “confirmation morning”, Rich was the first to spot it. The comet had moved 1.4 degrees due east. We all looked at it through each other’s telescopes. 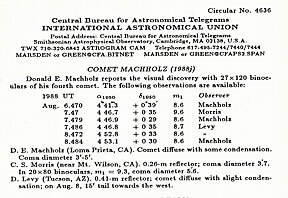 An announcement circular was released the following day (August 8) giving the name as Comet Machholz (1988j). An orbit was released the next day; it showed the comet heading toward the sun, approaching to within 14 million miles on September 17. Also announced was the fact that five Japanese comet hunters had picked it up on August 8.7, 2.2 days after I had found it. They had not swept the sky until the moon was less bright in the morning sky, and this cost them a name on the comet. One of them, Yanaka, apparently learned from this and found two comets in moonlight some five months later. 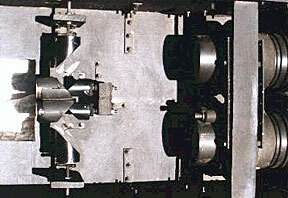 The discovery circular issued by the SAO. Comet Machholz brightened steadily for the first few weeks, passing just north of the belt of Orion in mid-August and displaying a short tail. But as it neared perihelion it faded. A few positive sightings and many negative sightings imply it did not survive its passage near the sun, a fate shared by my second comet, 1985e. Closer to home, the usual number of newspaper and radio interviews took place, with no TV interviews this time. I developed a short-term case of mild stuttering from the nervousness.